The portable x64 version (Q-Dir_Portable_x64.zip) is available for download. Can't help you, but can confirm that I have also experienced this. It could be your anti-virus causing the problem - try adding q-dir as an exception and see if that solves it. Great great great file explorer! i have this problem that the UI is freezing while copying, cutting & pasting. This is a terrible something and i want to know if i can fix it somehow. I remember that i didn't always have this problem..
i use q-dir v6.29, 64x on a win10 laptop. Full functionality of the file manager Q-Dir on Windows 10 tested with Build 10162. This time the portable x64 version is available for download. Yes, you are right. I contacted the developer about the missing portable x64 version about a week ago but I got no response. Portable 64-bit version not available on the SoftwareOK web site. I love this software - use it on every PC I own. The thing is... seems like I am seeing updates to it every 4-10 days. I get that the developer wants to keep making it better, fix bugs, etc... but wow... the update frequency is a bit much. Website shows a v5.95, but download links still point to v5.94. That's the reason why I changed back to v5.94. There are portable associations in Q-Dir . You can use them to set a portable music player to play .mp3 files. The only thing that hurts here in Q-dir is the lack of shortcuts. Pity that it doesn't have a shortcut to toogle Tree View. Also a feature to assign shortcut(s) for q-dir "programs" will be very handy, moving everytime to the status bar hurts. This was an awesome program. But lately, it has driven me nuts. Folders disappear, renamed folders revert back to their original file names. Wrong files and folders gets deleted. Such a waste. First TY for your wonderful, useful and time saving utility. I wanted to ask, as I finally read the distinction which is made between ansi // unicode. As a Win 7 user, "should", I have a preference? I decided to "try", the portable unicode, but if you will, just a few words on the preference of ansi // unicode. Again, TY for your application. Attention! When this program is checked "As Default Browser for all" interfere with windows such as: SaveAs ..., Open ..., Export ... usually using resources Explorer! Too bad, it's useful to display the colors of file types. Sorry for the expression of mistakes. At the rate Q-Dir is being updated by the author, its version number is liable to exceed the NVIDIA Forceware version number! I remember using v.4.38 once. I was stable for a few days and then would freeze for no apparent reason. Over the last couple of months, I've noticed how the software author updates Q-Dir nearly constantly with new version numbers ever time! 1) Either the software author tries to satisfy everybody all of the time. 2) Q-Dir is so unstable and full of bugs, the software author HAS to keep fixing it! I really hope it isn't #2. I love QDir - wonderful program! Sandboxie and Buster Sandbox Analyzer are a pretty good start for monitoring application behavior. Yeah I'm pretty sure it's a false alarm. Q-Dir has been around for a while and has a good rep with a broad user-base. @Dany and Juvera. Thanks for your helpful replies. I really appreciate your investigations, Dany. I did contact the program author about Q-Dir doing some risky things: Accessing Protect COM Interfaces of other programs and Installing Global Hooks into other programs. But I got no reply yet. I also know that antivirus scanners only scan for contents not active behaviors (they don't launch the program). So I do trust my firewall/anti-malware programs. But after research and seeing what others are experiencing I think Q-Dir is mostly safe. I do like that the author finally fixed the file size error if you set the right display preferences. finally! Sorry about the false alarm if in fact it was a false alarm. I have to confirm juvera's results for V4.80, all three portable versions (ansi/unicode/x64) are clean according to http://virustotal.com, which also includes Comodo. Also no warnings from Avast, Mamatu or Spybot when scanning or running Q-Dir. Stinger and HijackThis are also totally cool with Q-Dir. Downloaded from http://www.softwareok.com/ and not from an 'alternative source', as suggested by portafreeuser. If you suspect that Q-Dir harbors malware, submit the executable to"
I'm still getting Malware action warnings from all versions ever since and including v4.69. v4.79 brings up multiple warnings in Comodo. Some warnings are about trying to modify COM for other running programs that aren't even related to Q-Dir. Warnings also pop up that it is trying to inject computer code into other programs. This sounds like virus or trojan behavior. I can no longer endorse this program. v4.68 is fine though if you can get it from an alternative source. I'm not sure about this v4.69 version. Comodo Firewall reported that it wast trying to insert computer code into other programs which doesn't sound safe. Older versions passed Comodo Firewall tests without this issues so I don't know what's going wrong with the new version. I didn't notice much of anything new in v4.69 so I'm sticking with v4.68 which seems safer. I love this program and will still keep using it, but some non-zero file sizes are still displayed as 0.0 MB, which is incorrect. So be sure to get Properties before you go deleting those files. I love it too. I never see my apps updates ! Fantastic, but it doesn't have a search engine. I've heard it uses Windows's engine. In Windows 7 the option simply disappears. It's quite ugly for an "untrained" eye, but it's functionality is superb. @ Jod: You're right. I think this is a temporary error. It worked fine for me some hours ago. Can´t find the downlink in the site. This is brilliant EXCEPT that drag and drop breaks daily, sometimes more than once a day. It happens with big files, video usually. I edit video & move it around a lot. Unf, the author doesn't seem interested in fixing this. I've asked him several times and it's still broken. I'll even run debug mode to help out! This app is fairly good. I use it on most days, It is light and have many features. However, some of those features have quirky implementation. One major caveat is in its calculation of filespace. It uses rounding instead of rounding-up. So a file of 0.4 kb is shown as 0 KB. !! Do not use it to find/delete empty files !! can this replace Windows Explorer? i mean, can it capture all Windows Explorer processes? i tried xplorer2, and it sucked! it didn't capture all Windows Explorer processes, only some. i had to use xplorer2 launcher. i want a program that is capable of integrating into Windows Explorer so i don't have to launch a separate program to use Windows Explorer. right now, im using QTTabBar with Windows 7/64. It does everything i need, and integrates seamlessly into Windows explorer without the need to use a separate launcher. Only thing lacking is Dual-Pane view option. But im running a Laptop, so space is limited anyway. I could be wrong, but I think those are installed options, not for portables. In the status bar options (either directly from the status bar or through the extras menu) the options for "if no object is selected" are greyed out. Anyone know why that might be? Great app. Might become my primary file manager in Windows in the near future over xplorer2 lite (the outdated portable version). I wish this app would autorefresh when changes are made to the file system. Manual refresh is a bummer. Other than that, it does everything I need, quickly and in a pretty good interface. Quad view is great if you have the screen space to do it (I probably don't on my laptop). @ Me: I never experienced Q-dir FREEZING and hanging. On which OS do you run it? How many panes do you use? I second 100% your "...we need to cut Nenad some slack..."
I also wanted to say that we need to cut the dev 'Nenad' some slack. He is literally bombarded every day with numerous demands, suggestions, complaints etc, and as he is a one-man band and offers us a number of tools besides Q-Dir, and all FREE, should we be complaining if he can't answer each and every one of the emails he receives? The regular updates he provides for Q-Dir normally incorporate bug fixes and user suggestions as and when he can do this. One man, 24 hours in a day! He needs to sleep, he needs some R&R, but I doubt he gets much of either. Let's be grateful for what he does do. No problems here with drag n'drop, or cut and paste, but endless probs with Q-dir FREEZING and hanging. And of course it can't then be closed down even using Task Manager. This generally happens when I have a browser open with a few tabs being used. Needless to say I adore this little program, it's been the best thing since sliced bread for me. I just have to remember to give it full computer resources when using it. @spicydog: Sorry about the tardiness. I did as you said and my test file was pasted into C:\WINDOWS\, not any subfolder. Fwiw, on my system the right-click paste command is available anywhere within a given pane, not just up by the folders. XP SP3, Q-Dir 4.44. @pbr: Kindly try to reproduce the exact same situation... Please bear with me. QUESTION: Does your (test) file get copied in the actual C:\WINDOWS\ folder or inside the (sub)folder which happened to be selected by your right-click? Thanks for your confirmation, which I sincerely hope will prove that I am doing something wrong myself and this is not Q-Dir's bug... But I fear the latter is not the case. In my system (XP SP3 with Q-Dir 4.444) using Ctrl+C / Ctrl+V or drag-and-drop will work properly and will paste that (test) file in the "C:\WINDOWS\" folder. Whereas right-click cut/copy-and-paste will NOT work: The (test) file gets unavoidably copied inside the (sub)folder which is selected by the right-click. @spicydog: Actually I misconstrued your comment. What I should have said was that, in addition to drag-and-drop working properly, right-click cut-and-paste also seems to work okay for me...although I habitually use Ctrl+C / Ctrl+V most of the time. I've been using Q-Dir since version 3.something and I really like it. And I have no problem with drag-and-drop. Works as it always has. Added to my previous post (see above) right after the sentence: "So the only way to actually (successfully) paste is to use Ctrl+V".... Or (obviously) to click the 'Paste' icon at the bottom of the pane... Pretty unusual and rather "un-Exlorer" like, I would say! I also cannot cut files on one pane and paste them in the other! The paste options are not grayed out at the destination side but clicking on 'Paste' will only paste inside the selected subfolder! If there is no space to right-click, it is unavoidable that a subfolder will be selected!!! So the only way to actually (successfully) paste is to use Ctrl+V. However in some folders (with only few subfolders inside) the regular 'Paste' command works properly and that is not only confusing but can also lead to mistakes! I do not like that, and I believe that I am not the only one! It is also a real pity that the developer used to listen to user's advice and respond to bug notifications but that is no longer the case! Someone may say that it is understandable due to the incessantly growing (directly proportional to the popularity of the application) demand of new features etc. but still I cannot explain two new versions popping up every month while small (annoying) bugs are left unresolved. Since I am gradually giving up on Q-Dir, could anybody please suggest a nice (dual pane) alternative? I hacked my registry to use Q-Dir as the replacement for Explorer. it's really great. It uses much fewer resources than Explorer and doesn't thrash the hard drive like Explorer does. I highly recommend it. Great little time saving appilcation! Saving start up folder doesn't work. It seems saving setting doesn't work at all. If anybody shares my opinion on any of the points I would suggest to send multiple requests to the developer (support2006@softwareok.de) to stimulate a reaction. Sorry, that should have been a 3. Pre-selecting the renaming selection should be a feature that one can turn off. I agree with suggestion 2. It's a pretty cumbersome feature at times. I have asked the developer to introduce the 3 changes below but I get no response. Are they so useless? (I don't think so) But, hey at the end is somebody does not need them he/she can just keep them disabled, right? 2) Add a 'Vertical Scroll Lock Toggle' function to get 2 (or more) panes scroll together while scrolling (up/down) only one of them. 3) When renaming a file, by default the extension does not get renamed (gets excluded from the renaming part), this could be a useful option but in certain situation it is not. Could you kindly add (to Q-Dir's 'Extras') the option to enable/disable this feature? Anybody feels the same way? Maybe if the developer gets more requests he will consider introducing these small changes in one of the very frequent new releases. Very good utility for performing tasks on several directories or folders at the same time. Drag and drop works for me, but I haven't tried it with very large files yet either. This has replaced Windows Explorer for me since 2008. I cannot say enough to recommend it. The tabs are great and drag and drop works fine except for very, very large file loads - GBs. What I would like is to be able to group icons in all viewing modes. Thanks for the software - and it's free! WOW! Is there any way to get the stupid "moving" box out of the way when you're transferring files? This is a deal breaker for me, since I mainly use it to transfer large files, and if that message box is constantly in the way the program is useless. I'll have to continue to use explorer2 lite until I can find a fix for this. ..normally taken 2hrs all accomplished in 10mins. Great prg. Love this app! It has replaced Windows Explorer for me completely. The only problem is that Gmacri's comment about its inability to drag-n-drop files remains true for version 4.21. Have you try Unreal Commander Free File manager. Strange behaviour for me in the last few versions. First, from time to time, the program does not auto refresh. (create a new directory, and have to hit F5 for it to appear). Closing the program and opening makes it work again. The real annoying one for me at the moment is when copying files to a USB stick using the "send to" in the file context menu. If I do this in Q-dir, I get a popup saying that the target device cannot handle the document. Everything copies fine, but I get this annoying popup every time. This behaviour does not present itself in Windows Explorer or any other explorer replacement I've tried. This did not happen in the past, so it's something with newer versions. a better solution in the next versions." means? It's from v4.15 changelog. A perfect replace of Windows Explorer. 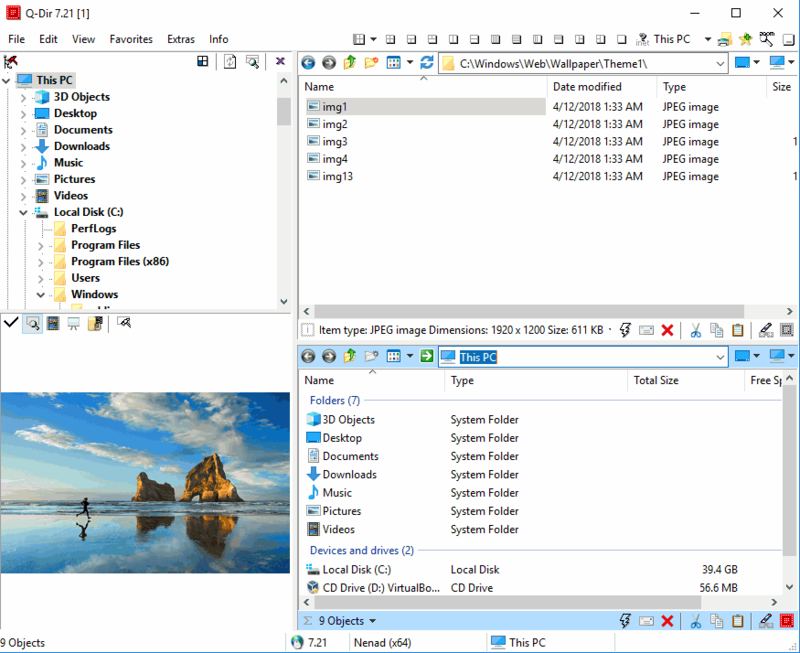 Though there are still some minor issues on copy-and-paste, it excels in other aspects when compared with Windows Explorer. Keep on the very good job. This is an excellent and somehow underrated file manager - better than all other free better known alternatives. It works like a German car, really. and uses very little resources. Highly recommended. Just wanted to echo joby_toss and Pistino. The developer of Q-Dir is incredibly responsive to bug reports and feature requests. I reported a bug, and got a fix in a couple days. Previous versions seem to work better. Version 4.01 features a Ctrl+W hotkey for closing last tab! Don't know about the shortcut but I close tabs by double clicking on them, yes a bit awkward. How do I close a second tab (new feature of version 4.00)? I'm having issues. It worked flawlessly for a long time, but now I can't drag-n-drop from one side to the other. I also can't cut files on one screen and paste them to the other - the paste options are grayed out at the destination side. Anybody else have this issue? Nice idea. It has a few problems: it can't seem to remember its settings. They work for one time and then the next time you have to reset them (on an XP machine). And, I have another PC running Win98, and it won't work there at all. This is something that has a lot of uses, it just needs a little work. Update coming soon? Inquiring minds wanna know! When copying by drag and drop a file in a folder with only folders (sub folders) contents, the file is copied to one of this sub folders and is not possible to copy the file in the desired folder. Also would be a good idea to add icons to move or copy files between windows. The program need some fixes, and may be, will be a very good program. But now I'll will be looking for updates. This program has serious potential but at current has some serious flaws. Be very careful when deleting items as the focus is not always what it appears to be. I will attempt to resolve this problem with the author as well. I used to use a fantastic MS-DOS file manager by the same name and version number. I am really curious if it is by the same author. I found no contact info. Under-rated File Manager! I've tried the popular managers like freecommander and ultraexplorer, but they didnt do it for me. Q-Dir feels the most similar to trusty Windows Explorer and has the multi-pane function nicely done. What a great program! Love it.